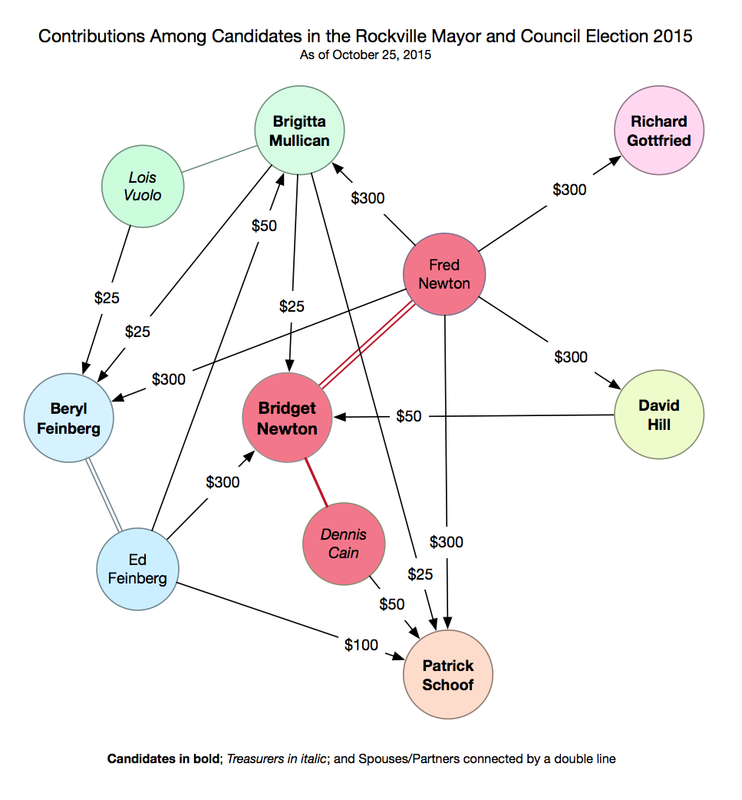 Armed with campaign finance reports from October 1 and 26, 2015 for the eleven candidates for Rockville’s Mayor and Council, I examined candidate’s claims about independence and the planning commission’s claim they are not political. Throughout this election season, several candidates emphasized their independence, positing it as an alternative to Team Rockville. Team Rockville is a campaign committee composed of Sima Osdoby for Mayor and Virginia Onley, Julie Palakovich Carr, Mark Pierzchala, and Clark Reed for Council who have publicly stated a shared vision for Rockville and that they are supporting each other and pooling resources (disclosure: I am the chair of Team Rockville). Examining the financial contributions among these candidates shows they are closely connected, which is no surprise. More interesting are the contributions among the other candidates, their spouses/partners, and their campaign treasurers. As can be seen in the number of contributions and amount of funds, it reveals a clear pattern of strong and weak relationships. 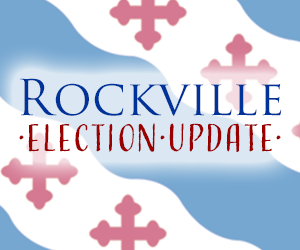 Although the non-Team Rockville candidates claim to be independent and an alternative to a slate, through their contributions Bridget Newton, Beryl Feinberg, Brigitta Mullican, and Patrick Schoof have coalesced as a group. Through her husband Fred, Bridget Newton has been the biggest donor among the group, providing $300 to each of the non-Team-Rockville candidates, which is a major contribution for a Rockville campaign. Patrick Schoof, on the other hand, has been the greatest recipient of contributions from the other candidates. Richard Gottfried and David Hill seem to be on the outside with very few connections. The flow of contributions from the Rockville’s Planning Commissioners also provides an insight into local politics. At their July 22, 2015 meeting, I was surprised by Chairman Don Hadley’s statement during a discussion about the Rockville Pike Plan that, “We [the Planning Commission] are not a political body and we are not playing politics; we’re dealing with issues.” (at 1:53). As a person appointed by the Mayor and as a 2013 candidate for City Council who touted his service on the Planning Commission during his campaign, Mr. Hadley would certainly know that the Planning Commission is as involved in politics as it is in the zoning code. The campaign finance reports confirm that opinion. Every Planning Commissioner contributed to one or more campaigns, except for Anne Goodman, revealing their political alignments. Commissioner Goodman contributed to no campaigns, making her perhaps the only person on the Planning Commission who can rightfully say she’s not involved in politics. 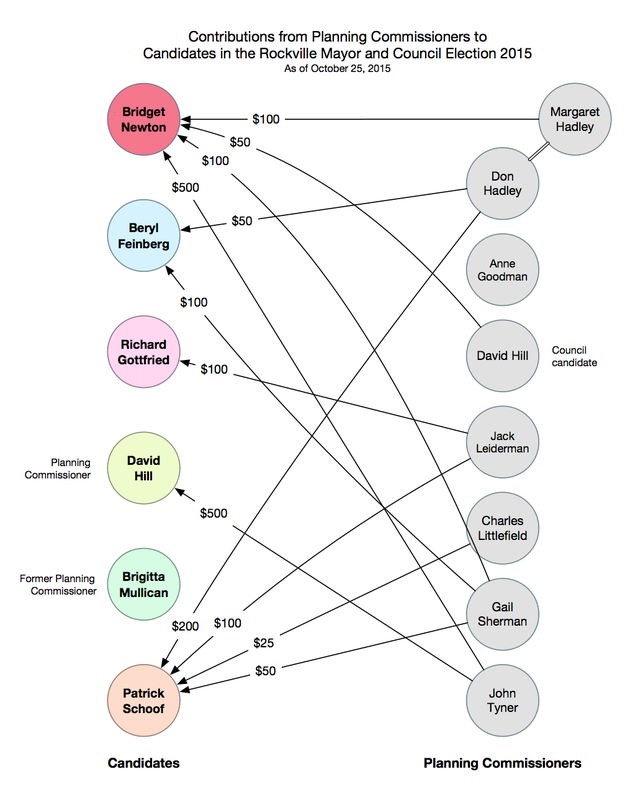 As can be seen in the chart, Bridget Newton and Patrick Schoof were the greatest recipients of contributions from Planning Commissioners. Strangely, the Commissioners don’t feel as supportive of one of their own. David Hill, who is a Council candidate and currently serves on the Planning Commission, received only one contribution, although it was a very large one from John Tyner. Brigitta Mullican, who recently served on Planning Commission, received no contributions from any Planning Commissioners. It’s unclear what’s happening, but one interpretation is that these people have served together on a city governing body and as a result aren’t willing to endorse them for City Council. Finally, no Planning Commissioner contributed to the campaigns of the candidates associated with Team Rockville, drawing another distinction between the two groups. As you can see, there are actually two different groups contending for Mayor and Council: Team Rockville and Newton-Feinberg-Mullican-Schoof. They have different approaches in political campaigning and have very different approaches for governing the City of Rockville. Choose which approach you prefer with your vote on Tuesday, November 3! I am not sure what point you are attempting to make with your analysis. From my perspective, there is nothing inappropriate or unethical for the Mayor and the non-team members to support those they want to see elected. In fact, given that they are competing against a 5 member team that has aggregated resources for team coordinated efforts, why not support other candidates running against the Team. Given your role with the Team which you have acknowledged, your credibility to discuss this issue is compromised and should bring critical questioning. I am sure there are Team members who are being supported despite their association with the Team. That speaks volumes about the independence of Rockville’s voters. I doubt theses folks will accept your guilt by association attempt your are making. Max’s point is very clear by the fascinating donation chart. Why ISN’T the planning commission supporting a single member of Team Rockville? These are all fine, experienced folks who outshine those who have never served the city in formal or informal capacities — ie, Schoof and Gottfried. Voting against a team simply, on principle, because they are a team, which Jim Coyle is advocating, is so cynical and political, undemocratic and demeaning to all candidates. Does anyone really think there’s NOT “shadow” slate? Team Rockville’s former members demonstrated their independence of thought and action. They are also completely transparent about their affiliations.